I don’t love the title either. What can I say? It was blunt, but it was honest. And while the kid looked a little dazed at first, I think he also appreciated it–or at least he recognized it as true, and ultimately as a decision he’d have to make. Last week I got back on the recruiting beat for Tech. On Monday, I hit Rome and on Wednesday, Athens (Georgia that is… we also have Cairo and Bethlehem for those scoring at home). Either during or after our presentations, an inevitable question is: “Should I take an AP class or a dual enrollment class at a college in my area?” Another version: “Is it better to take IB or AP?” Or perhaps: “Should I take the fourth year of Spanish or another science course?” The beauty of my job is I can simply respond, “it depends” and then walk away. But I don’t… or at least I haven’t yet. It’s true though… it does depend. Are you applying to a school with a 50%+ admit rate (and be reminded that would be the vast majority of colleges in the country) where they publish an academic formula for how they make decisions? Well, if that’s the case, then no, it does not really matter. Do what you want to do. You will know before you apply if you’re going to get in or not, because they’ve published their standards online. If you are having problems doing the math of the formula they use to calculate whether you’ll be admitted, i.e. SAT + GPA = X, then I’d suggest you consider donating your application fee to a charity instead. If you’re asking because you are legitimately concerned about which is the better foundation or preparation for college, then choose the one which most aligns with your intended major or future aspirations. But if the question is about “getting in” to a highly selective school (let’s arbitrarily say a 30% or lower admit rate, which would be around 100 of the nation’s 2000+), then the clear answer is take the tougher class and make an A in it. 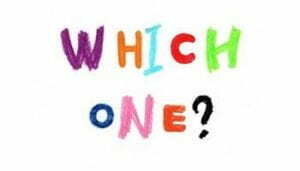 Which one is harder? You know better than I do. Be honest with yourself about it. Is the reason you want to go take English at the college down the road because your high school’s English teacher is known to be really tough? Well, then you’re ducking rigor–and that’s not going to fly in Yale’s admission process. Is the reason you want to take Spanish really because of your passion for the language, or because you don’t know if you can juggle Chemistry, Physics, and Biology in one semester? Bottom line: the students admitted to Stanford will take the three courses, suggest a more efficient way to run the labs, and teach the Spanish class. Don’t misunderstand me. I want kids to be kids too. I wish we could go back to the 70’s, and not only because of the sweet clothes. It would be great to re-visit a time when students could pay tuition by working a part-time job, and getting into your state’s flagship was merely a matter of graduating from high school. But that’s not where we are. Application numbers at the most prestigious schools continue to go up. These places are not growing substantially in enrollment, so their admit rates continually decline. The competition is real. You will hear college reps on panels talk about holistic admission and looking at the entire person. We’ve all signed on to the Turning the Tide report. We are not lying. We do want kids on our campuses who will genuinely care about others, positively influence their local community, and play integral roles in their family. But at these places the baseline competitive applicant is so high both academics and outside passions and impact are possible. Think about something in your community: band, soccer, chess, debate. There are levels of those activities, right? The truly elite young soccer players are committing their time to academies and clubs. They’re playing year round and spending their weekends traveling, doing skills sessions, watching film. If you want to make the team next year, you keep on pushing; you keep on lifting weights or running on your own; you keep on going to camps in the summer. Yes, those are sacrifices. No, there is not a lot of balance. But that’s what being in the top 1-5% of soccer players around the country requires now. The same is true of highly selective colleges and universities. The applicants getting accepted have chosen rigor. They have piled on academic courses, in addition to all of the other things they’re doing outside the classroom. Don’t interpret this as my endorsement of overloading academics or any pleasure in exacerbating the situation. I can poke holes all day in the methodology of the rankings or point fingers at people in certain communities who insist on their kids applying to a very specific subset of schools. But that is not the question at hand. Similarly, I don’t think my Tech alumnus friend was saying, “Forget your family and work all the time.” He was saying in that climate, and in that field, and in that city, you’re not going to have work/life balance if you want to be the most successful. Let me bottom line this for you: the most elite schools are going to continue to admit the students who have pushed and stretched and challenged themselves the most in high school. “But Jerry Rice and Brett Favre came from lesser known schools and were NFL superstars.” “What about the kids in the small remote village who never hears the gospel?” “I read about a kid who got into Harvard who had some Cs and low test scores.” Okay, sure, But we are talking about YOU. If you are “that student” at the session asking an uber-selective college if you should take one course over another, save your query to ask about whether the vegetables are locally sourced. Still don’t love the title, but it is accurate. 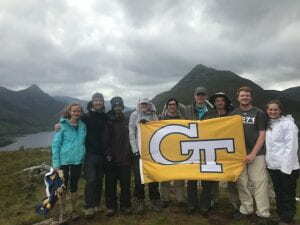 Last week I traveled to Scotland on a Tech Trek trip, backpacking with 10 of our incoming freshmen. Prior to the trip, these students only knew each other for a few days. The group was made up of engineers, business majors, designers, scientists, and programmers…. libertarians, democrats, republicans… passionate vegetarians and outspoken carnivores. In terms of gender, ethnicity, family background, worldview, career aspirations, and dancing styles, this group ran the gamut. While they are all the same age and have chosen the same college, their differences were clear. They came from as far west as Seattle and as far east as Connecticut. 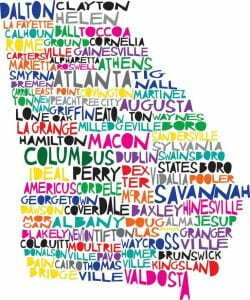 They attended elite out-of-state private schools and rural Georgia public schools. Conversations reflected their disparate backgrounds, which made the trip both fascinating and encouraging, even when we inevitably had disagreements or controversy. It would have been easy to allow their differences to create barriers and exacerbate divisions. But over the course of our nine-day trip, through sharing tents, trading food, and splitting bottles of water, they only grew closer. When someone was struggling with a tough day, another student was quick to offer to carry a pack, offer an encouraging word, or attempt a song rendition as a distraction. Over the course of our 52 mile hike, we gained 17,411 feet in elevation with well over 40 pounds on our backs. Scotland gave us its best and worst. 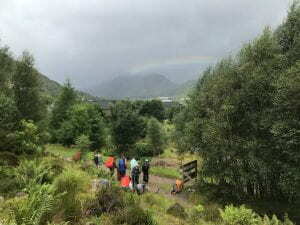 We saw rainbows and sunsets and summits, but also endured furiously driving rain and heavy winds on high, exposed ridges. Ultimately, the struggles and the victories unified everyone as they built trust, respect, friendship, understanding—and, ironically (despite exhaustion), patience. By the time we rolled into the last town on our hike, these strangers from a week before were not only sharing toothpaste, but toothbrushes as well. Sadly, it was there we learned about the tragedy in Charlottesville. A myriad of emotions swirled in my mind when I started reading more and listening to some of the early news reports: sadness, embarrassment, disgust, and a fleeting desire to pursue a longer travel visa. But the image I could not get out of my head were of the people behind shields and masks— combative and closed off. What does this have to do with college admission and the college experience? Everything. If you are about to start your freshman year in college, it’s likely you’ve spent the last year focused on “getting in.” I urge you to thoughtfully consider what it means to “lean into college.” Getting into college only puts you at the front gate. Sure, you are there–you have your schedule, your bags, and a room assignment. But being “in” is an inherently solo status. Leaning into college suggests risk and vulnerability. It will put you a bit off balance; it will put you squarely outside your comfort zone, but it’s a forward-facing posture. Leaning in helps you make new friends and connections; it helps you listen and consider a new, different, or opposing point of view; it helps you summit a mountain one step at a time. Why are you going to college anyway? Have you actually reflected on this question? Have you written down goals for your freshman year or your college experience? If not, I hope you’ll take some time to do that. I’m talking about a pen and a piece paper you can actually pin up on a bed or board. You’ll be surprised to see getting a degree is only one item on a fairly long list. College done well is about expanding your network. It’s about developing critical thinking skills which transcend industries, job changes, cultures, and natural shifts in the market. It is about learning to more completely articulate your point of view by understanding those which are different. Leaning in puts you in classes and conversations at tables and forums where diverse thoughts and backgrounds have the opportunity to be heard and considered. Leaning in broadens, stretches, advances, and enhances you as a person. In contrast, a homogeneous network is a limited network and inherently diminishes your potential for opportunities and long-term success. Unfortunately students do this all the time–they join clubs or organizations or teams, even academic colleges or majors, and start putting up barriers, drawing lines, and minimizing their sphere. They begin to point to other groups on campus as “other.” But for every “other” you name and shut out, you simply rob yourself of an opportunity to grow, learn, be challenged, and expand your knowledge and network. Naming “others” puts you figuratively behind a shield and mask and will limit your relationships, decrease your perspective, and directly impact your future potential in the workplace or graduate school. You have gotten in. Now it’s time to lean in. Share some toothpaste, or even a toothbrush. You’ll be glad you did. They’re off to great places! This week Senior Associate Director of Admission, Mary Tipton Woolley, joins us on the blog. Welcome, Mary Tipton! My daughter started kindergarten this week, and it seems like only yesterday she was born. Such a cliche, but oh so true! In preparing for the start of school, I decided to write her a letter. 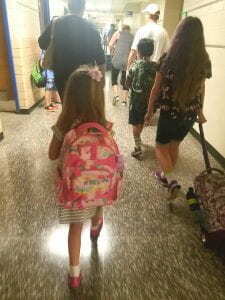 When I finished, I realized the feelings of a parent sending their child to kindergarten are likely similar to those felt by parents sending their child to college. Sure, she’s still sleeping across the hall, but I suspect those other feelings are not so different. But I worry that in the midst of applying to college, and the focus on getting in, getting out, success, and achievement, overshadow the natural feelings of a family getting ready for a big transition and the opportunities that come with it. If your house was like mine this summer, there were some extra tears and arguments – no doubt a sign of underlying nervousness on all our parts of what is to come (or maybe it’s life between a mother and daughter!). It’s yet another reminder that as parents we learn and grow right along with our kids! Here are some of the thoughts I shared with her in my letter…. I hope you will arrive at school every day with your ears and eyes open for learning. Your teacher will put her energy into helping you learn and grow, but it’s your responsibility to take advantage of all that she is offering you. You’ll also have to practice what you learn – after all, none of us learned to read or spell or excel at anything without practice! I hope you will continue to respect your teachers, and not be afraid to ask questions about matters that are confusing or contrast with what you think/believe. It’s okay to do that, so long as your mind and heart are open to understanding perspectives that might challenge your own. Your friends will also push you to grow and learn. You’ll keep some of your old friends and make new ones. Frankly, you’ll probably learn more from them than in your classes (but don’t tell your teachers I said that!). They will make you happy and sad, excited and frustrated! That’s okay too…you’ll do the same to them. Remember there’s a heart inside everyone you meet that deserves to be respected, no matter how much they make you mad or how much you disagree with them. Sometimes your friends will be better at things than you are. Cheer them on and celebrate their successes with them, because at some point the tables will turn and you’ll be better at things than they are. Then you’ll have them to celebrate with you too! Don’t stop asking questions. Your dad and I will continue to be open and honest with you, even when we know you may not like the answer we’re giving you or it makes all of us uncomfortable! Don’t be afraid to fail! We’ll be there to cheer you on when you succeed and when you fail – there’s as much to be learned from failure as being successful! Don’t let fear stand in your way of trying something new. You’ll miss out on some amazing lessons in life if you do. Trust – We are trusting a school community with our children. That takes a lot of trust – even more so when you’re sending your child to college! It’s a great reminder of the responsibility we have as educators to embrace those in our charge and work to help them have a smooth transition. The communication from her teachers and school has helped me gain trust in them. Parents, take advantage of all the ways a college wants to communicate with you – parent newsletters, parent program offerings, and family weekend are just a couple of examples. I searched several university and military academy websites, and all have parent programs featured prominently in search results. Go find yours! Logistics – I’m thinking about what my daughter is doing throughout the day. Did she find her way to her classroom? Could she open her lunch thermos? Was the spaghetti still hot? Did she make it to her after school bus? I’m sure these feelings are amplified when you don’t see your child every day. Before you drop off your child at college, set some parameters surrounding your expectations for communication. My parents suffered through a child who would go a week without checking in (sorry, mom… I get it now!). The only way to ensure all parties are satisfied, and not stifled, by communication is to keep talking about it. 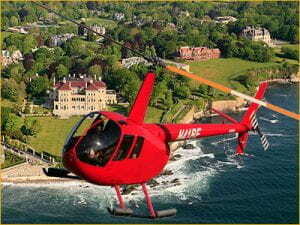 At a conference in Newport, RI in July, I entered my name in a raffle to take a helicopter tour. On the day of the drawing, the organizer announced her 2-year old son selected three lucky winners. I almost stood up because I instantly knew I had one of the spots locked down. Can’t say what it is exactly, but me and 2-year olds… we get each other. And sure enough, my name was the first one called. The ride was incredible. 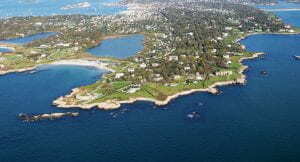 Partly because Newport is a truly beautiful area by land, sea, and from the air. Hundreds of sailboats, famous mansions along the cliffs, and great views of farms and wineries. But I think one of the coolest and most amazing parts of the ride was simply taking off. I know it sounds obvious, but you rise up straight off the ground. There is no taxiing, accelerating, or partially up before all wheels are up. Just whoop– up! No effort. No build up. Blades spinning, seat belts buckled, doors closed, headphones on. You’re airborne. With the Common Application, Coalition Application, and most institutional applications now open, I encourage you to view your senior year, and the admission process, as a helicopter tour rather than a plane ride. When you board a plane, you are always focused on where you are going. Destination is king. I’ve been on some pretty important plane rides in my life — headed to weddings; attending funerals; going to graduations; traveling to make speeches and presentations. When you board a plane, you have a precise endpoint in mind. Delays are annoying… lack of coffee when they forget to refill the water prior to departure is irritating (thanks, Flight 2225)… turbulence is scary. What you remember if the flight is smooth is… well, nothing. What you remember if it’s not, is the inconvenience. In contrast, a helicopter tour is going to end up at the exact spot you started. The person who dropped us off just sat in the lobby and waited while we flew around Newport. She knew we were coming right back. The point of the ride was not to get somewhere. The point of the ride was to see, learn, explore, appreciate, and gain perspective. 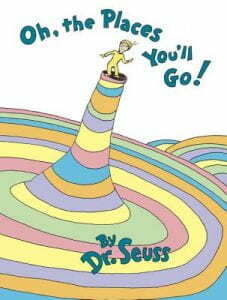 I would assert the same is true of the college admission process and your senior year in general. The admission process is not about the destination. It’s not about one school or one city or one campus. If that’s your perspective, or if it starts to creep into your mind this year, I am earnestly imploring you to consider why you’re cheating yourself of growth. If you see this experience as a helicopter ride, then it becomes about what you learn about yourself along the way. It’s about understanding when the brochures arrive in the mail (or when you visit a campus, or when an alum or neighbor tries to convince you to apply or choose a certain college) why a school is, or is not, a good fit for you. Let’s say you apply to Stanford (the country’s most selective institution) and you get in. If it’s a plane ride, all you did was get on board, buckle your seat belt, and arrive in Palo Alto. Congrats, it’s sunny. But how did you grow? What lessons have you actually learned over the last year to help you thrive and navigate in your new community? I’d say few. I’d also say you wasted your senior year. Sure, you made a few fives on some AP exams. You went to prom. Maybe you even won some games, garnered some awards, or made some money. But do you know yourself more deeply after the experience? Do you know why you are there, and not somewhere else? Did you truly choose this college over all others? Or did you simply arrive? Don’t get me wrong. I’m not saying you shouldn’t have a solid list of schools, or even one as your first choice. But if “college” is all wrapped up in one place; if success is wrapped up in one place; I’d urge you to think about helicopters, not airplanes. If this is a helicopter tour, you will see a ton in the year ahead. You will ask probing, personal questions into those headphones at 200 feet–your questions, not questions someone told you to ask. You will look down over the landscape, your choices, from a different perspective. I would assert if your senior year is a helicopter tour, nothing can teach you more about yourself than the college admission process. Helicopter tours are meant to be enjoyed and appreciated. “Touring” through college admission, rather than “flying” through it, will teach you more valuable lessons than you’ll ever learn in an AP class or get from an online lecture. If it’s not about the destination, then getting deferred or waitlisted are not reasons to question your intelligence or potential. If it’s not about the destination, you won’t be as frustrated or bitter to see someone else land where you wanted to be, while you get diverted to another airport. Instead, the turbulence, the delays, the re-routes, are simply part of the ride. They don’t shake your confidence. Your blades are still spinning. Your headphones are still operational. Helicopter tours may land in the same spot, but the passengers get off with an entirely new perspective. If you’re reading this and you’re starting your applications now, I have no doubt in a year from now you’ll be packing your bags for college. The question is your ride between now and then. So fly well.